Lucy Morgan reports the hell out of Gov. 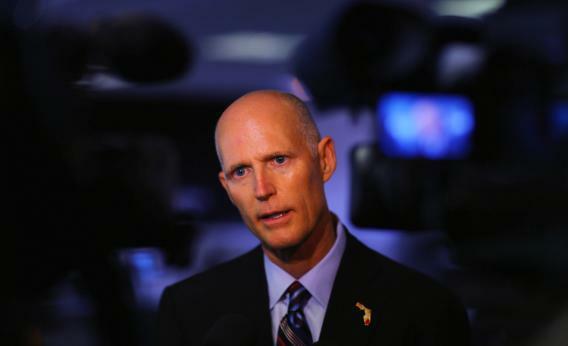 Rick Scott’s awfully opportune* of a rescue dog. The New York Sun, which appears to exist in a golem-like form, wants us to lower the debt limit. This is a movement that needs to be nurtured, particularly if the Congress flinches again and raises the debt ceiling. Jackson grasped the whole picture. He fought the monetary fight on every front. He had deep and abiding convictions. He talked about it in constitutional terms. Paying off the national debt under Jackson actually led to some unexpected disasters. Governments need to hold some debt, crazy as it sounds. Elise Foley updates us on the immigration reform pre-game. The BrowBeaters de-code the Zero Dark Thirty cast. Michael Hastings’s e-book about 2012 is ready for your virtual shelf. And Matthew Yglesias remembers Aaron Swatrz. *I changed my wording here – I originally said “Indian-giving,” and while I have no personal guilty feelings about the term, my usage was actually wrong.